Simple causes of knee pain often clear up on their own with self care. Being overweight can put you at greater risk for knee problems. 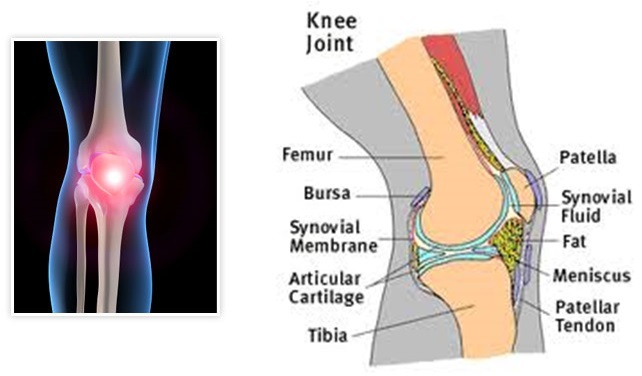 Less common conditions that can lead to knee pain include bone tumors. Rest and avoid activities that aggravate your pain, especially weight bearing activities. Apply ice. First, apply it every hour for up to 15 minutes. After the first day, apply it at least four times per day. Keep your knee raised as much as possible to bring any swelling down. Wear an ace bandage or elastic sleeve, which you can buy at most pharmacies. This may reduce swelling and provide support. Avoid running straight down hills -- walk down instead. Bicycle or swim instead of run. Run on a smooth, soft surface, such as a track, instead of on cement. Lose weight if you are overweight. Every pound that you are overweight puts about 5 extra pounds of pressure on your knee cap when you go up and down stairs. Ask your health care provider for help losing weight. Use ice three to four times a day for the first 2 or 3 days. Cover your knee with a towel and place ice on it for 15 minutes. Do not fall asleep while using ice. You can leave it on too long and get frostbite. When you sleep, do not lie on the side that has bursitis. Place a pillow between your knees when you lie on your side to help decrease your pain. If you are overweight, losing weight may help. Do you feel the pain all the time, or off and on? Is the pain in your entire knee or one location, like the kneecap, outer or inner edge, or below the knee? Do you have other symptoms, such as pain in your hip, pain down your leg or calf, knee swelling, swelling in your calf or leg, or fever? Your doctor may inject a steroid into the knee to reduce pain and inflammation. You may need to learn stretching and strengthening exercises and podiatrist (to be fitted for orthotics).